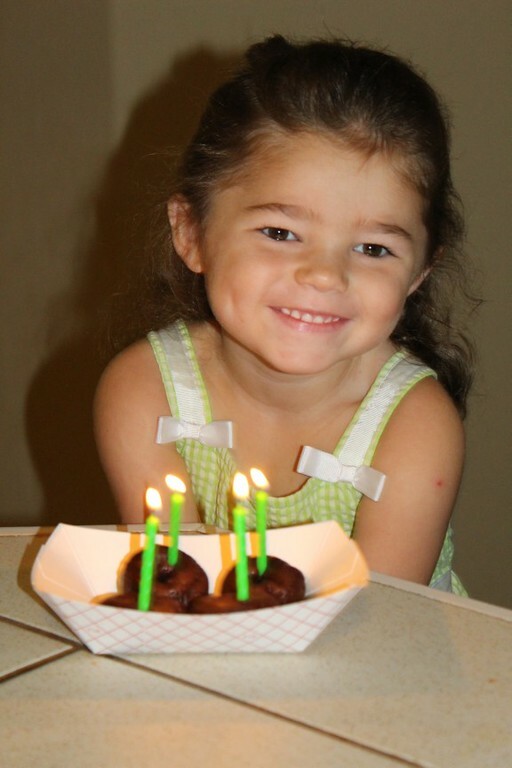 When I woke Keaton up this morning, I told her that it was her birthday and she said "you need to get candles for my doughnuts." Well, of course I had candles for her doughnuts and after everyone put on their clothes we began the breakfast celebration. Graham really wanted to go outside and fly his helicopter this morning but we weren't home long enough for that. Yesterday the boys had some gift cards and birthday money (yes from December and July) and their mother finally let them spend it at Walmart. They both bought remote control helicopters even though that would not have been my choice since we have had at least 5 previous ones and they all end up breaking. I really don't know what else they could have bought-possibly an xbox game or a legos (Anderson). Anyway, Graham is the only one who still has his helicopter since Andeson's copter is now stuck in a tree out back. We rushed to church this morning trying to beat the crowd-today was the 75th anniversary of Geyer Springs. This was a big day so even Keaton (not Whitman) went to big church. And big church we had this morning-videos, music, recognitions, preaching-wonderful. The kids were very interested to learn that Grandpa was one of the 37 people that started Geyer Springs. Grandpa's dad was the first Sunday school superintendent. Robby and I have been there all of our lives and we can even remember the 50th anniversary of the church. As we went to bed tonight, Robby told the kids how old they would be when the church turns 100. He went on to tell them that they might be married, possibly with their own kids, some of them may be having to help plan the celebration or even help us carry our lawnchairs. During church, Hughey stood up to preach so Graham bent down to pick up his Bible and grabbed Anderson's Bible as well his own. When Graham put Anderson's Bible in his lap, Anderson put it back down in the floor. I picked up my Bible next along with Anderson's Bible and he again put it in the floor. That is when I grabbed his arm and made it clear to him that he would be using his Bible-he glared at me and said "there is only 1 minute left." My child was busy watching the clock and had no idea that today would not be just an hour service! The service was about an hour and a half but I could have set and listened to our choir for another hour or two. After the service was over and I grabbed Whitman, we went down the hill to eat lunch. They had hot dogs and BBQ and after quickly eating, the kids found their friends. The boys played football (Anderson appeared to be the quarterback), Keaton found Evelyn and Campbell played with Molly and Hayley, Reagan helped with Whitman who was enjoying running around. It was quite fun having a picnic with a few hundred of our closest friends. We eventually went back inside to tour the new church building-new classrooms and most importantly to us-new bathrooms in the children's area (no more taking kids to the other side of the building to use the restroom.) Then it was on to the fellowship hall filled with memorabilia from the last 75 years of church history. Robby and I were well represented in the pictures so that gave us all a big laugh. After finally making it home, we rested and then woke up ready to continue the birthday girl's celebration. We picked up Grannymom and Grandpa and headed to Conway. It was Conway or Branson and we figured that Conway was a tad closer to try out the new Andy's Frozen Custard. Keaton again reminded me about her candle and was so happy as we all gathered around her to sing Happy Birthday to her. Everyone ate their ice cream and it was really a celebration because Robby and I didn't split one, we had our own! We looked for the moon (lunar eclipse) on the way home but couldn't really see it do to the clouds so once home, it was bedtime for the crew. Tonight's bedtime went much better than yesterday's bedtime-mainly because we didn't let the kids go upstairs until we were up there as well. Though bedtime didn't go well for Whitman-silly me, after he had been in bed for at least 45 minutes I walked by his room and noticed that I had left his light on. He was still wide awake just looking around probably wondering if I would ever return to turn off his light!